Larkin (upper body) will miss the next two games, while Vanek (lower body) is out for at least Tuesday's game at Boston. 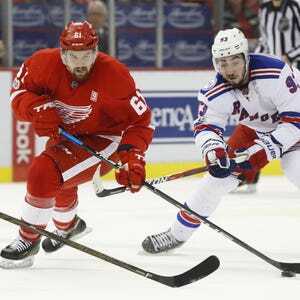 Detroit – Preparing for two vital games this week, the Red Wings received bad news on the injury front. They’ll be without forward Dylan Larkin (upper body) for games against Boston on Tuesday and Toronto on Wednesday, while Thomas Vanek (lower body) is out for the Boston game, but coach Jeff Blashill wouldn’t rule Vanek unavailable against Toronto. The news comes after the return of Justin Abdelkader and Darren Helm after lengthy stays on the injured list. Vanek was hit by an Andreas Athanasiou shot late in the first period of Sunday’s 1-0 overtime loss against the New York Rangers. Vanek hobbled to the bench and down the hallway to the locker room and did not return to the game. Larkin was hurt late in the game, according to Blashill. So with Vanek and Larkin not playing, who will take their place? Blashill said Jurco will re-enter the lineup after being a healthy scratch for the last nine games. Jurco has no points in 11 games this season, with a minus-3 plus-minus rating. Blashill wants to see Jurco establish his skating, then everything else should fall into place. “Jurcs is a really good hockey player,” Blashill said. “Jurcs can play in the NHL and be a good player in the NHL. When Jurcs plays his best hockey, he’s skating on the forecheck, skating on the track and he allows his skill to do the rest. The other forward spot will be filled by either Drew Miller or Steve Ott. Miller cleared waivers Monday – no other team claimed him after he was waived Sunday – and was assigned to Grand Rapids Monday, per collective bargaining rules. Miller is expected to rejoin the Red Wings in time for Tuesday's game. The Red Wings could also activate Steve Ott (shoulder), who has missed the last five games but practiced Monday and appears close to returning. Ott hurt the shoulder in a fight with Toronto’s Matt Martin during the Centennial Classic on Jan. 1. The injuries come at an unfortunate time, given the importance of these next two games against teams that are ahead of the Red Wings in the division. Outlook: Boston (23-21-6, 52 points) is 3-5-2 over its last 10 games and sinking badly…The Red Wings rallied from two three-goal deficits to defeat the Bruins, 6-5, last week in a shootout....Boston is under .500 (10-12-0) at home.